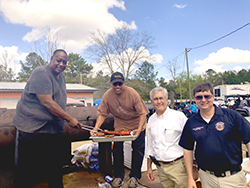 Morris Hill, a Greene County board supervisor, serves barbecue ribs to friends at the 2018 Black History Parade. Shown above, from left, are Hill, Marshall Runderson, Mark Maples and Trent Robertson. This year's parade is set February 23. Revelers will roll Feb. 23, in Knobtown’s Black History Parade when this sleepy settlement of 200 inhabitants turns into a destination drawing thousands of visitors. Greene County’s Knobtown community annually hosts the event the last Saturday in February. This year marks its 25th anniversary. The parade starts at 1 p.m. and lasts about two hours along a 9½-mile course. The affair began in 1994 when members of Mount Olive Missionary Baptist Church realized that the community’s children were not being taught their culture’s heritage in the local public school system. Oliver Walley was one of the founders of the event, and his daughter, Amanda Joyce Johnson, is one of the current organizers. The parade route begins at the church, 19872 Martin Luther King Jr. Drive, and ends back at the same spot. Immediately following the parade, folks gather at the church for a program featuring a speaker and singers, or they return to the camp sites for fellowship. Participants pay $5 for floats or cars and $3 for all-terrain vehicles or horses. Participant fees as well as proceeds from T-shirt sales fund a $1,600 college scholarship for a graduate of Greene County High School. Criteria for the selection is based on grades, church participation and community involvement. The scholarship is named the P.T. Johnson Scholarship in memory of the church’s former minister. 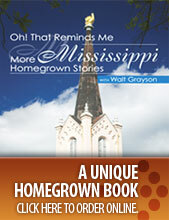 Black history education will take place at the church 6-8 p.m. nightly Feb. 11-14. This year’s theme, “Drink, Stand, Grow,” represents unifying the wisdom of the elders with the energy of the youth. “It stands for ‘Drink from the river of knowledge. Stand for something. Grow into the beautiful, strong, fearless, successful black American you were born to be.’ The whole event – education week and the parade – will center on that idea,” Johnson said. On parade day vendors sell food or crafts, booths display information on black history and attendees socialize with friends and family. Visitors begin arriving in Knobtown on Thursday before the big event and usually stay until the following Sunday or Monday. They rent spaces from local landowners to set up motorhomes, campers and tents. This year will be the first time that an official “Meet and Greet” takes place as Morris Hill has planned a fish fry and mingle from noon until 8 p.m. on the Friday before the parade. Hill, the first black elected to the Greene County Board of Supervisors, represents Knobtown, State Line and other District 2 communities in northeast Greene County. He has served the past six terms. “It’s been a huge success and, praise God, without incident these past 24 years. We have at least 5,000 visitors, and I believe there have been some years when we attracted as many as 10,000 people. I base that on helicopter photographs that capture the size of the crowds,” Hill said. The parade attracts more than members of the black community, as a significant number of whites and Hispanics also attend. “That’s because all people are made to feel welcome,” he said. Hill sets up a barbecue grill and feeds friends and colleagues on the morning of the parade. It’s his time of year to show hospitality to local volunteers, to fellow members of the board of supervisors, to other elected officials and to law enforcement. More information about the parade can be found via Facebook on a page titled “Black History Parade Knobtown” or by calling Johnson at 601-410-0012. Award winning journalist Nancy Jo Maples lives in Lucedale and is the author of “Staying Power: The Story of South Mississippi Electric Power Association.” She can be reached at nancyjomaples@aol.com.